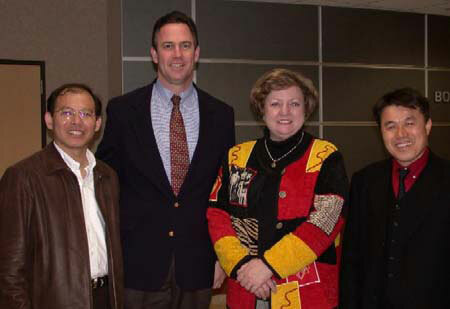 Korean teachers Yongwhi Kim and Young Chan Cho with representatives of the Conroe Independent School District.From left to right: Yongwhi Kim, CISD Assistant Superintendent of Secondary Education Don Stockton, CISD Assistant Superintendent of Elementary Education Jean Stewart and Young Chan Cho. Thanks in part to efforts by the Sam Houston State University Office of Field Experience, two Korean teachers got a taste of what it's like to live in America and work in the Texas school system. Young Chan "Charles" Cho and Yongwhi "Anthony" Kim recently finished working in the Conroe Independent School District as part of a seven-week training program in pedagogy and American culture sponsored by the Texas International Education Consortium. Brian Miller, coordinator of the SHSU Office of Field Experience, said this was the first year SHSU has taken part in the program. "There are 32 universities in Texas that are affiliated with the Texas International Education Consortium, and this is the first year SHSU has participated in this international endeavor," Miller said. "The Office of Field Experience became involved when the cooperating teachers in the public schools needed to secure Korean teachers to learn from and work with. I acted as a liaison between SHSU and the school districts to make that happen." Cho and Kim arrived in Austin on Jan. 4, with 30 other Korean teachers willing to take part in the annual program. The teachers spent several weeks in the state capital before each traveling to their assigned schools to work with an American mentor teacher. Working with Miller, Cindy Brennan, coordinator of special programs for Conroe ISD, agreed to sponsor Cho and Kim. Cho was paired with mentor ESL teacher Jodie Neill at Oak Ridge High School and Kim with ESL teacher Bryan McHenry at Conroe High School. Miller said Cho and Kim, who both teach English in Korean schools, are taking part in the program to learn how English is taught to American students who are not native speakers. "As English teachers in Korea our two guests came to Texas to learn about teaching procedures and techniques used in teaching English as a second language," he said. "As part of the program they spent much of their time with a teachers who teach ESL in a high school setting. They have also visited bilingual and ESL classrooms on several other Conroe ISD campuses." Cho and Kim also visited SHSU to get a look at an American university. "I gave Mr. Cho and Mr. Kim a tour of campus and a tour of the Teacher Education Center the day they arrived," Miller said. "They also met with Dr. Michele Hewlett-Gomez, director of Bilingual and ESL Educator Preparation Programs at SHSU." As well as showing them the university, Miller was given the task of finding local host families for the teachers. "I asked individuals whom I knew at the university for suggestions on who would be good hosts for the Korean teachers in this program and who would enjoy the opportunity to have a extended cultural exchange with a Korean teacher," Miller said. "As a result we secured two marvelous host families, who tell me they have thoroughly enjoyed their Korean guest and the cultural exchange." Bernice Strauss, director of academic support programs at the SAM Center, agreed to host Cho at her home in Conroe. She said both she and her husband David have learned from the experience. "Prior to Mr. Cho's arrival I did not consider what we would gain from the visit. The experience has surprised me in many ways," Strauss said. "I have learned a great deal about Korean life and Korean society. I realize that I may have been very Euro centric and not even given much thought to Asia and the enormous diversity that exists there. "However, even more than the wealth of information, I have enjoyed the communication and discussion that has shaped my family life," she said. "I believe I will remain in contact with Mr. Cho once he leaves my home. I feel certain that the thread he has established with our family will be maintained long into the future." Kim lived in Huntsville during his visit and was hosted by Mr. and Mrs. Morris Walker. Walker is the former mayor of Huntsville. While studying in the Conroe schools, Cho said he found American schools to be very different from ones in his native country. "The most different thing is the mood," Cho said. "It is more free and relaxed here than in my country. My country is very strict." Strauss said Cho returned to Korea Feb. 14. She said she believes the visit gave him an added respect for American schools and educators. "I believe he enjoyed his visit here," Strauss said. "He told us that he was impressed with the level of expertise that teachers have demonstrated." Although he had visited America before, Cho said familiarizing himself with the school system allowed him an even better understanding of the country. "This is a good chance for me to see America correctly," he said. Miller and Strauss said it is also an opportunity for SHSU, and the whole community, to see Korea better. "I am very committed to the increasingly international dimension to Sam Houston," Strauss said. "I believe that having international programs enhances our reputation as a university but, even more importantly, it adds a dimension to our education of students." It can also add to international awareness, Miller said. "This program can be used as a vehicle for breaking down some of the cultural barriers that exist in our society today," Miller said. "As the world essentially becomes smaller through technology and communication, it is important that we learn about our neighbors in other countries. "I am glad to see Sam Houston is taking the lead in this area."